Firstly heat 1 tablespoon of oil in a pan and add the minced beef with onion cubes, garlic and ginger pastes, salt, garam masala, green chilies and red chili powder. Pour 1/2 cup of water and stir well. Allow the meat to be cooked until the water dries and the oil starts to float on top. Set aside the fried beef. Then add the flour, 4 tablespoons of oil, salt and 1 cup lukewarm water to make a smooth dough. Make small balls out of the dough and roll each ball out like a flattened round shape. Cut 2-3 round shapes out of the flattened dough. Fill each half of the circle with the fried beef filling. Cover and close the filling with the other half of the round shape. Twist the circumference or the arced ends of the folded semi circle so that the filling does not come out and a braid like design forms. And now repeat for the rest of the dough. Heat a deep frying pan with oil and fry until golden brown. 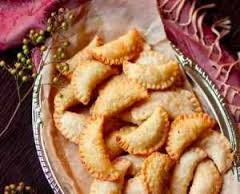 Use enough oil so that the pitha or the beef pulis are submerged in the hot oil. Finally serve this beef puli any decorated plate or decorated bowl.